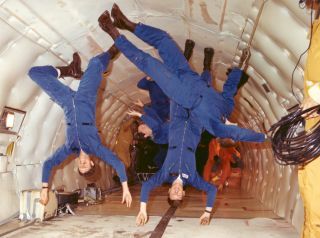 Six astronauts get to experience weightlessness on the KC-135. In this 1978 photo from the U.S. space agency, six astronauts who had been in training at the Johnson Space Center for almost a year are getting a sample of weightlessness. They are onboard the NASA KC-135 that uses a special parabolic pattern to create brief periods of microgravity, affording astronauts and astronaut candidates a preview of spaceflight. These flights are nicknamed the "vomit comet" because of the nausea that is often induced. The photo should be viewed with feet at the top. The three astronauts in the foreground are (left to right): Richard O. Covey, Steven R. Nagal and George D. Nelson. In the center background is Robert L. Stewart. Obscured in the background are Norman E. Thagard and Ellison S. Onizuka.